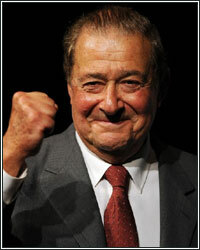 Now that HBO has landed the most gargantuan of mismatches in Pacquiao-Marquez III, Bob Arum is pulling out all the stops, throwing Manny Pacquiao on as many advertisements as possible in hopes of getting the casual fan to tune in. Time Warner's affiliate channels will broadcast commercials leading up to the fight, Pacquiao and Arum will be guests on "Piers Morgan Live", and anything and everything will be done to potentially squeeze out as many buys as they can. Arum did this earlier in the year for Pacquiao-Mosley in hopes of smashing Floyd Mayweather's numbers, but he still came up a wee bit short (we're still waiting on those official final numbers), which isn't a good thing considering that Mayweather-Mosley only had the usual four episodes of 24/7 to help promote the bout. While his methods are a great idea, we have to understand that, just like Pacquiao-Mosley, this is an attempt to get people so incredibly interested in the fight that they'll overlook how overmatched Marquez is going to be come fight night, and that there is a very real possibility that we'll have another Mosley disaster on our hands. Pacquiao himself is one of the most mundane people to interview, next to Oscar De La Hoya, due to his seemingly limited English skills, which is no fault of his own, but that means Piers Morgan will more than likely have scripted questions when doing the interview. All in all, it'll be a fun time for you casual fans, but guys like us on FightHype already have an idea on what's going to go down. Speaking of Pacquiao, "Pacquiao-lite" Nonito Donaire is more than likely also going to return in November once his pasty opponent is chosen. Donaire looked like he was going to have a breakout year when he destroyed Fernando Montiel by vicious knockout, but he sunk his own ship by signing with Golden Boy Promotions while still under contract to Top Rank. It will be Donaire's first fight since February. Trust me on this one: Vernon Paris, Lamont Peterson, Lucas Matthysse and Robert Guerrero will be our title holders at 140 this time next year. Amir Khan, Devon Alexander, and Timothy Bradley are taking their business seven pounds north, but they're leaving the division with enough competitive fights that'll satisfy fans for years to come. Nobody makes me laugh more than IBF Super Welterweight champion Cornelius "K9" Bundrage, who called out Manny Pacquiao earlier this week on FightHype. Bundrage is looking for that last big payout and has turned down the challenges of Vanes Martirosyan, Erislandy Lara, Deandre Latimore (the #1 contender to his belt), and will more than likely turn down Pawel Wolak, all of whom would be heavily favored to beat him. Certain fighters would kill for the attention Bundrage has gotten from the fight community. Unfortunately he's not waiting for the right fight, he's waiting for the right pay. Mares barely got by undersized Vic Darchinyan last fight out, and he drew with Yohnny Perez prior to that, whereas Agbeko never looked better in throttling Perez in their rematch last year. I expect the rough and sturdy Agbeko to walk Mares down en route to a decision win in a fantastic fight. Potshot Picks is 19-4 (82%) year to date. Danny Howard can be reached via e-mail (dhoward@fighthype.com), Twitter (@DBHoward126) and is looking for friends on Facebook.